Beautiful chorus girl who did some not-too-bad uncredited work – we heard this story before. Yet, Joy Windsor is a more tragic example than most – she was forced to end her career due to illness. However, she reinvented herself as a nightclub singer and then got married and ended her career o raise a family. Let’s learn more about her! Emily Smith was born on February 4, 1931, in Columbia, Missouri, to William E. Smith and Emily Richards Smith. Her younger brother William E. Jr was born on March 24, 1933. Back into town today came the most unloved girls in New York. By the critics. And pop-eyed Union Station, attendants and red caps stared at the long-legged beauties and borrowed Ken Murray’s famous phrase “What’s wrong with that?” The girls were from the cast of “Blackouts,” Murray’s variety show that ran for seven years in Hollywood and flopped after only six weeks, on Broadway, “The critics killed us,” said Pat Williams, 18, one of the attractions of the show. “Audiences were wonderful, just like they were in Hollywood, but the critics panned us. And we closed.” Pat, who is from Tacoma, Wash., was followed off the Santa Fe’s Grand Canyon Limited by the tall, stunning blond twins, Joan and Jean Corbett, also 18. Redheaded Joy Windsor, 19, was a step behind. The three are Burbank lasses and their families were there to meet them. Joan (or Jean, they are exact twins) commented wistfully, “Maybe the critics just don’t like California products.” A train brakeman whistled and murmured, “I’m seeing double but what’s wrong with that?” Murray and his wife stayed behind in New York and will arrive here on the Chief tomorrow. Joy continued working in Los Angeles, dancing in other shows. Probably in part due to her chorus experience, Joy was signed to a contract with a studio and started her acting career. Joy started her career in Sands of Iwo Jima, a well-made war movie. She then appeared in Women from Headquarters, a movie completely forgotten, but with an interesting plot and with a woman in the lead (played by Virginia Huston, whom I profiled on this blog before). Unfortunately, it’s a B effort that never raised any dust, and such movies with a feisty female lead remained a rarity for years to come (and even today still are). After a Fun on the Run short, Joy had an uncredited role in His Kind of Woman a pretty good film noir with a fine pairing of Robert Mitchum and Jane Russell. While I always tought of Russell as a not that talented sexpot, she was actually an okay actress who more than did her share in movies such as this. Joy’s next feature, Sunny Side of the Street was an idiotic musical (plot: a singer wants to get famous) with no real reasons to watch it. While it is to some degree happy-go-lucky, it still lags behind much better upbeat musicals. Terry Moore and Audrey Long are perhaps the only lights spots in the production. Joy fared no better in her next movie, The Family Secret – this one is pure low-class soap opera (courtroom style) with not enough quality drama and too much pathetic drama, and no good actors (case in point – John Derek – not that bad-looking but a trunk of wood as far as acting goes). Joy was then in another short, Hula-La-La, before doing two totally typical 1950s movies – Ten Tall Men, a typical adventure with Burt Lancaster as a French Foreign Legion soldier, and The First Time, a Robert Cummings as a first time dad comedy of manners. Both movies are well made, great to look at and amusing to some degree, but on the other hand they offer nothing truly exceptional nor do they soar above the middle of the barrel status. Another similar movie was Sound Off, a Mickey Rooney vehicle – a military musical where he plays a nightclub entertainer who is drafted and so on… It’s nice to watch and not too bad, but nothing to shout about. Rainbow ‘Round My Shoulder was a sweet and light musical with Frankie Laine. Due to some medical problems, Joy had to give up her career after this movie (read more in the private life section). 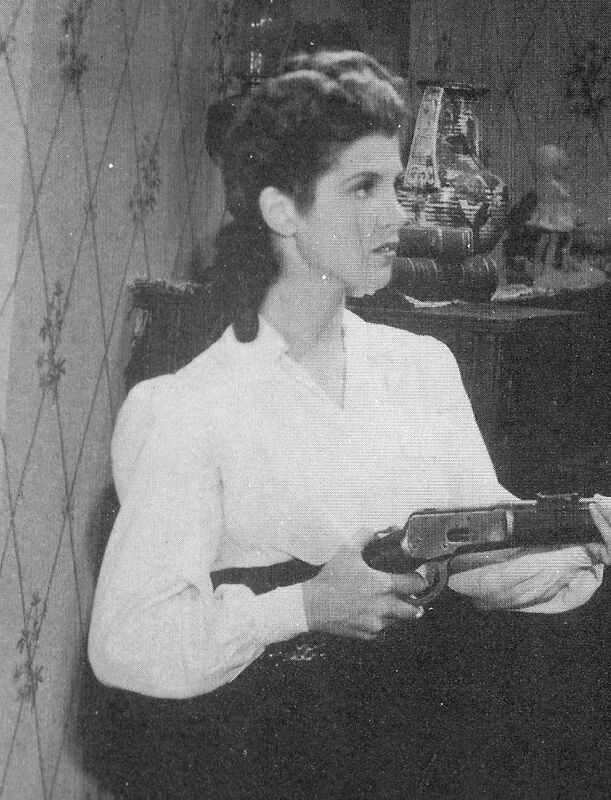 She returned to the screen one more time in 1956, with Come on Seven, another short comedy, and then retired for good. Joy’s first Hollywood beau was David May. The press termed him a boy who ‘who plays around with department stores’, and who ‘thinks Joy Windsor is more fun’. Unfortunately nothing came of the liaison, and May married Ann Rutherford later. Hollywood stalwart Dave Siegel and Joy became pretty good friends not long after she entered the chorus world, and despite not being romantically involved, they were often seen around town, enjoying late suppers and dancing. He would remain her reliable and sturdy “go-to” guy for going out when more interesting beaus were nowhere to be seen. In the early 1950s, Joy did quite a bit of work for the US military effort. She traveled with a plethora of entertainers to Korea and to the Caribbean, and was often seen in the newspapers. For a time in 1952, Joy dated Buddy Rudolf, who dated and ditched June Horne right virtually to the altar (he went to Japan for business and didn’t return for two years), but the relationship simply withered after a few short months. In December 1952, Joy started dating avowed bachelor Paul Ellis. They became seriously quite quickly – in January 1953 Paul Ellis told Joy Windsor at the Sportsmen’s Lodge that he’ll fly to Mexico to see her new night club act. However, they had a nasty bust up in April 1954 and both started dating elsewhere. In May Joy was dating Frank Harper at the Sportsmen’s Lodge, but her heart was still with Paul. In June 1954, one night, Paul Ellis went to a fancy club with new swain Jane Wurster but she went home and he was joined by Joy Windsor who had watched the first show with Dave Siegel (and then conveniently ditched him). They spend a wonderful summer together, but storm cloud were never far from their love sky. THey had some serious issued by September, and in October had a love spat as a result of a tense and, on Joy’s side, tearful confab at Ciro’s in the midst of a concert. They “broke up”, but the same month, a funny things happened: onlookers observed an unusual situation at Ciro’s when Martha Martin Ellis ringside with Roger Valmy; at the next table sat her ex, Paul Ellis, with Lucille Barkley, and just adjacent Paul’s recent steady date, Joy Windsor, with Stanley Richardson. They couldn’t keep from each other – they were back dating the same month. They broke up in early 1954, and made up in April 1954. However, in May 1954 she was seen with famed attorney Bentley Ryan (partner of the legendary Greg Bautzer). In late May Paul gave Joy Windsor a farewell dinner before she went to Europe for three months. They resumed their romance when she returned in August. All went well for the remained of the year, but another termination came in January 1955. They made up, yet again, in March 1955. Joy wanted to become a nightclub singer and she wasn’t kidding – that month She had flown to the Philippines for an engagement. Then the papers solemnly announced she was supposed to marry Ellis on April 16, just one months away. Ah, but what can happen in a month! Everything seemingly went well, but then, two days before the marriage, Joy suffered a nervous collapse. The wedding was postponed. Nobody knew the reason, but the columnists rightly deducted that there was a lot more than came out in the story and wondered if the wedding wall ever take place. Then, to nobody’s surprise, they canceled it quite acrimoniously. Both tried to act as if nothing happened and they would go on as usual. Paul Ellis dated Dorothy Porter at the Gourmet Beverly, but the truth was quite different from the illusion. In the meantime, Joy was seen with Marshall Ebson. Then, sometime in May 1955, she caught polio and was hospitalized. Luckily, only her leg was affected, but she had to give up her movie career after this, as she had to wear a brace. In August 1955, she was still wearing a leg brace, but went dancing frequently with Bentley Ryan. In September 1955 she dated Bob Moon, a radio producer. In October 1955, things started to shift in relation to Paul – Joy flew to New York and was planning to stay there for a longer time. Paul, who heard that she was to depart to the East coast, tentatively called her, then took her to the Luau for dinner and then to the airport. Joy’s plans for a long-term New York sojourn were quickly squashed – by November she declared that the local weather was too much for her, she changed her mind about living in the east, flew home and then to the desert. She accidental “ran” into Paul there, and he bought her a dinner at the Palm Springs Ranch dub. And just like that, they were together again. The reunion lasted only a few weeks, alas. In early November Joy and Paul had a battle and everything is off again between them. ON a positive note, by late November, there were news that, if she’s careful, doctors told Joy that she can go out evenings without the brace on her leg. Early in 1956, she took off the braces for the first time and did Ciro’s with Paul (obviously they were “on” again). 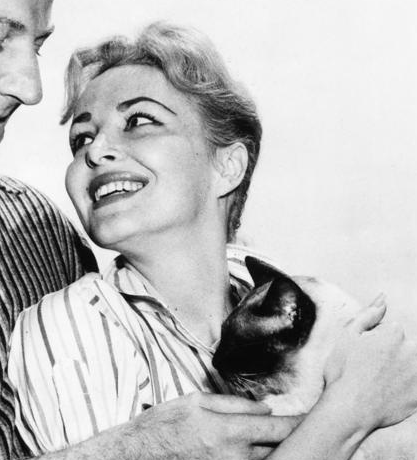 But Joy was still seen with other beaus – Ruth Roman’s estranged husband, Mortimer Hall, was one of the more serious ones. 1956 seemed like a tranquil year for the couple. By May she was again with Paul, and this time for good it seemed. In October Joy spent three days in the hospital fighting anemia. In early 1957 she was seen around with Paul, often with company like Joyce and Noel Clarke, Grace Pope and her sister Helen Sanders and so on. Then, in May 1957, literary out of nowhere, Joy married bandleader Charlie Barnet. Trust me, I was shocked to read this. After such a wonderful year with Paul, marrying a guy who…. She was his (wait for it!) 10th wife!!! Imagine this! Ten wives, and you are not yet 50. He said, somewhat ironically, that “I like the girls to match the upholstery of the car.” “We are ideally happy and deeply in love,” Joy said to the papers. She said she met Barnet two weeks ago and started singing with his band. They decided to elope Wednesday after attending a cocktail party. They flew to Yuma for the wedding ceremony and returned the next day. The couple planed a week-long honeymoon in Hollywood (how romantic… NOT) and after it was over, continued living there. Barnet was born on October 26, 1913, into a wealthy New York family, making him almost 20 years Joy’s senior. Instead of becoming a lawyer like his parents expected him to, he became a jazzer. The marriage was very stormy and they separated in early June. By mid June, Joy was already dating Leonard Ackerman. On June 28, she hits the newspapers by seeking an annulment for he marriage. “I got an ulcer.” she famously said to the judge. She charged him for never intending to consummate the marriage and that he refused to set up a proper household. What a sad and worrisome affair 😦 She won the annulment on August 9, 1957. Barnet married his last wife, Betty, in 1958 and stayed married for the next 30+ years. He died on Septeber 4, 1991. Just a few days later she was back with Paul Ellis. What a roller coaster their relationship was. After all the ups and downs, they married on August 12, 1957 in Carson City, Nevada. They honeymooned in Hawaii with Paul’s ex-wife and daughter (weird!). By October Joy was pregnant, and in November ended up in the Cedars of Lebanon hospital suffering from a flu attack. Ultimately, Joy and Paul had two children: Richard William Ellis, born on May 9, 1958 and Paula Lee Ellis, born on June 18, 1959. Joy settled into a peaceful family life from then on. Her brother William Smith went on to become a popular actor, and always credited his sister with helping him get a foothold in Tinsel Town. Joy Windsor Ellis died on November 6, 2006 in Santa Monica, California. After profiling more than a hundred obscure actresses, I can say that I am not easily impressed. More often than not I see a pattern – young girls who have a zest for life go to Hollywood and thus break with tradition, but in the end, after a short career, they often return “home” to become wives and mothers. Only a few didn’t follow this path, and those women sometimes impress me – Caroline Burke is one of them. After a short and sketchy Hollywood career, she became a very successful female producer and left her mark on both early TV and Broadway. Boy, was I impressed (I like this word, can’t you see?) with her professional achievements! But, let’s more about her! Caroline Flora Berg was born on July 7, 1913, in Portland, Oregon, to Charles F. Berg and Saidee Berg. Her older brother James Forrest was born on January 5, 1901 in Portland. Her father was a prosperous merchant and the family was well off, employing at least one servant at any time. Caroline grew up in Portland, and attended high school there, developing a taste for performing at an early age. After graduating from high school, Caroline majored in art at Bryn Mawr College, and afterwards returned home to Portland. Unhappy with being a society wife, with her father’s backing and generous donations from friends, she started the art history department at Reed Col­lege in Portland. She also studied art in Paris and London during this time, but I could not find the exact years. Caroline moved to New York at some point. As an actress, she appeared on Broadway in “Brooklyn, U.S.A.,” and Gilbert Miller’s “Heart of a City.” She was also an advertising and radio writer on the West Coast. Some weeks ago, a petite New York miss named Caroline Burke came to Hollywood, Object: Screen career. Experience: Two bits in Broadway shows and some radio appearances. Hollywood producers were not sufficiently interested to give her interviews. Agents Â·were too unimpressed to represent her. The girl’s few acquaintances. Instead of encouraging her. stressed the difficulties of crashing studio gates. But pint-size Miss Burke is a person of determination, “Others have done it,” said she, “and so can I.” After mulling her problem for days, she wrote a poem–a humorous lament about the inaccessibility of movie producers. In it. she named ~the men she had unsuccessfully tried, to see. She sent her poem After mulling her problem for days, she wrote a poem a humorous lament about the inaccessibility of movie producers. In it she named the men she had unsuccessfully tried to see. She sent her poem to Variety and the editor printed it. Within two days every man she had named tried to sign her! And that was the story of how Caroline got into Hollywood! Caroline’s big moment came with The Mysterious Rider, a, you guessed it, low-budget western!! Heck yeah, and she ended up like most actresses that got their big chance sin such movies – nowhere! The rest of Caroline’s brief acting career just serves to emphasis this sentiment: she was never credited again, appearing only in bits. 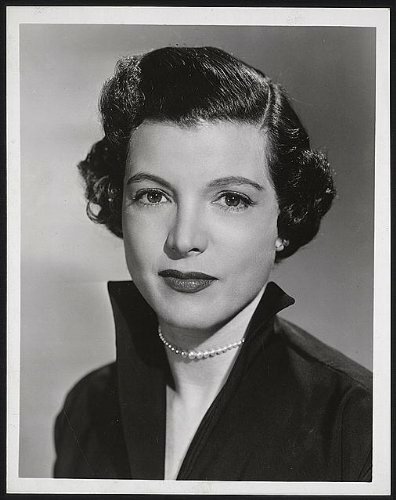 In 1943 she was in Silent Witness , a solid but a tad bit too predictable Republic studios potboiler with some impressive bur very underrated cast – Frank Alberston, Maris Wrixon, Bradley Page… The story, while a bit formulaic, is not half that bad – a ruthless attorney gets dumped by his kind hearted fiancee and then the tables turn on him… Nice to see a not so sympathetic character in the lead, and he does get better as the movie progresses. Up next came Spy Train, a completely made-to-order low-budget thriller set on a (you guessed it!) a train. If has all the typical elements for a movie of such caliber – a handsome lead who’s a reporter, a charming love interest, antagonists (this time the Nazis), and a mix up (completely identical bags). It’s obvious from a hundred miles how it’s going to end, and the movie is solidly made but that’s it – nothing more, nothing less. In a world where there are so many good movies to watch, this one just doesn’t take the cake. The cast is decidedly second tier too, with Richard Travis, Catherine Craig and Chick Chandler. By this time, Caroline was well aware that her acting days are over. 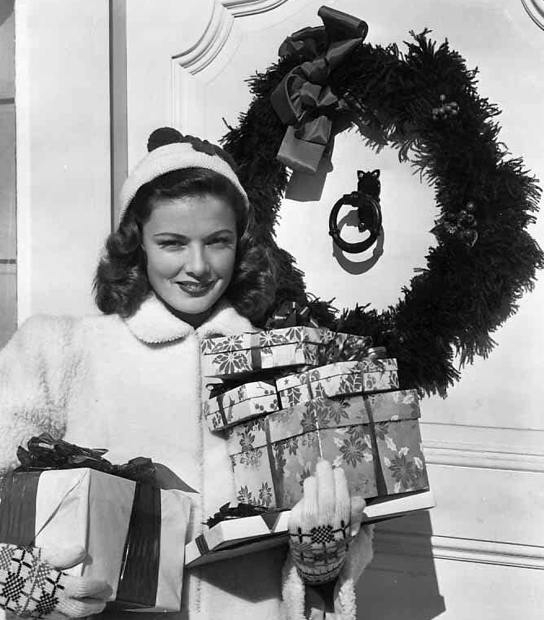 She appeared in a small role in one more movie – the best known of the lot, Rhapsody in Blue, considered one of the best musicals of the 1940s. But, instead of kicking back into domesticity and obscurity, Caroline chose another path for herself. On her first movie interview, New York actress Caroline Burke said, “I’m a complete nonentity can’t play gin rummy don’t have any wacky lapel gadgets and I’ve never been out with Vic Mature!” The press called her “unique”. Caroline was a lover of all things beautiful and had an eye for art. She had an impressive doll collection, which she had arranged a half-dozen small cloth peasant dolls in authentic costumes along a wide bookshelf. Behind each is Caroline’s oil painting of the doll with wood frame painted in the rich color only. Caroline Burke’s Birthday Honored Alton Brody played host in his Beverly Hills home Tuesday for a cocktail party celebrating the birthday of Caroline Burke, recently arrived from New York. Caroline wore, in honor of the occasion, an afternoon frock of turquoise blue shantung fashioned with slim skirt, slightly bloused bodice with drawstring neckline at which she wore a red gold clip set with diamonds, rubies and aquamarines. Guests stayed on after rock-tails for a buffet supper of chili, macaroni, salad and other dainties, and to watch Caroline slice a cake topped with blue and white candles. Later the guest of honor adjourned to The Players with a group which included the John Brights, John being the author of “Brooklyn. U.S.A.” in which Caroline made her Broadway debut last winter. Among those who attended the Brody party bearing gifts for Miss Burke and old recordings which are to be donated to the salvage drive sponsored by the American Legion were Messrs. and limes. Walter Pidgeon, John Wayne, Allen Rivkin, Ira Gershwin, Harpo Marx, Charles Feldman, Walter Kane (LynnBari,) Norman Krasna, Michael Kanin, Howard Lang, Jules Stein, William Goetz, Ben Goetz, Ben Hecht, Conrad Veidt and Budd Chase. Caroline was obivously a natural-born hostess and no wonder she had a reputation as a sought after party girl. On a more serious note, Carole did her share for the war effort – in the summer 1943, she gave up the idea to an Alaskan cruise for shore duties at a Harbor canteen for service men. Caroline was also a witty conversationalist. Columnist Edith Gwynn once said that Caroline couldn’t find an apartment that would take dogs so she decided to look for a veterinary who will take people :-). Another example: Caroline reported that the following note was received by the police department in Portland: The guy who lives next door to the police station is a crook and ought to be prosecuted to the full extent of the law. I cracked his safe last night and found it full of black market coupons”. She was also friends with author Kathleen Windsor. Caroline was present when Kathleen was asked at a Philadelphia author’s luncheon whether her racy book, “Forever Amber,” is an autobiography, and she replied: “If it had been, I wouldn’t have had time to write it”. Caroline was also quite headstrong: she had the forcefulness to carry out the ideas she conceived. For instance, she wanted a work of Picasso, so she got one from him. Caroline dated Morton Gould, the composer-conductor, for a time. He visited her when she was in the Doctors’ Hospital with a strep throat that same year, but the relationship fizzled not after. Caroline Burke married Cyrus Max Adler, a millionaire camera manufacturer, in the late 1940s. Cyrus was born on January 19, 1899, making him 14 years older than Caroline. He was married once before, to Selma Caroline Adler, and they had a daughter, Betty, born on April 17, 1927. As a wealthy socialite, Caroline became prominent in the art circles in the US. Unfortunately, the marriage did not last and they divorced in the early 1950s. Adler died on June 22, 1959. After her divorce, Caroline and Norman Krasna became a premier twosome-about-town. Caroline was fresh out from New York (and TV duties) and spent some time in Hollywood with her beau. Unfortunately, the relationship didn’t last. From 1946 to 1956 she was one of television’s first women producers, producing, writing and directing network television for the National Broadcasting Company, including the awar-d­winning telecast of Pirandello’s “Six Characters in Search of an Author” and the memorable Wanda Landowska [the harp­sichordist] at Home in the Wisdom Series. In 1955 she toured the Far East where she taped interviews with the heads of various governments for N.B.C. Caroline married her second husband, Erwin D. Swann, an advertising executive, vice president of Foote, Cone & Belding Ad Agency (Mad Men anyone?) sometime in the 1950s. Swann was born on December 9, 1906 in New York. He was married once before, to noted Broadway actress, Tamara, who perished in the 1943 plane crash in Portugal (songstress Jane Forman was on the same flight and suffered serious injuries). Caroline and her husband lived in Manhattan and had a home in Durham Furnace, Bucks County, Pennsylvania. Caroline kept busy even outside the theater sphere – was an art editor for Diplomat magazine, an owner of a California radio station, a teacher of television production at Columbia University, a sometime writer and teacher — often simultaneously. She truly did have a very impressive and varied career in the arts. Caroline and her husband amassed an impressive collection of modern art, consisting of, among others, paintings and draw­ings by Picasso, Gauguin, Klee, Miro, Vuillard and Roualt and sculpture by Rodin, Degas, Braque and Zorach. Caroline Burke Swann died on December 5, 1964, from a brain tumor in New York. Her widower died in December 1973.